Since arriving in Germany, the Esprit has been used mainly for weekend drives. There are some good stretches of Autobahn close to where I am living and prove great to test runs etc. 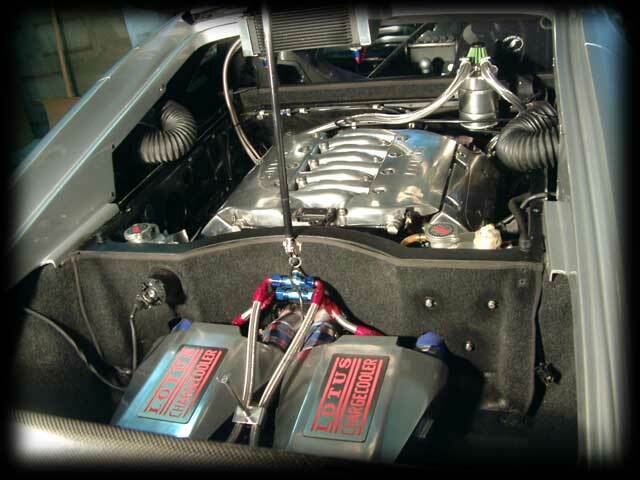 Getting the car up to 160 mph has been proving very easy and given longer stretches the speed mounts with incredible ease. I have been experimenting without the rear wing and a fair amount of drag is removed when running without it. I also started to ´open-up´ the rear of the car to improve cooling and to add an additional engine oil cooler. After removing the rear number plate surround, I finally put my Dremel to good use and cut away the bodywork around the number plate and the area behind the cooling vents in the bumper. These are now covered in a metal mess. Some other routine maintenance found me replacing the exhaust manifold heat shields; Not a fun job given the space constraints. During a test run following the heat shield replacement, I had my first major drama with the car. During some gentle acceleration, there was a very high pitch whine followed by a nasty popping sound. This was immediately followed by clouds of white smoke from the rear of the car. 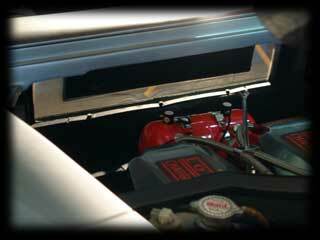 My fear was of an engine fire, so I armed the external triggers and jumped out to check the problem. There was no external evidence of a problem and the engine was running smoothly when I turned off the ignition. I started the car once again and it became clear that the problem was with the RH turbo. Oops...... time for a quick phone call for help. After being towed back home by my wife, I set about investigating the problem. It was soon apparent that the main shaft had snapped on the RH turbo and that the bearings had collapsed. I set about removing both turbos and made a call to Ramspott & Brandt (German Lotus specialists) to source some replacement hybrids. Removing the turbos proved to be quite a challenge given the seizing of the turbos nuts etc. Given the state of the coolant and oil feed/returns, I decided to take the chance to replace them with a spare set that I had kicking around. This in-turn involved the removal of the engine mounts, which I also replaced with some new ones I had aquired along the way. I was very worried about the metal particles that had resulted from the impellor dis-integration. When I dis-assembled the charge-coolers, I discovered that some small metals parts that had made it past the charge-cooler cores had been captured within the pre-throlle collector. I double checked this by looking at each of the cylinders and was very pleased (but not suprised) to discover that each plug showed proof of excellent combustion. Whilst I had the rear end of the car in bits, I decided to fit an oil catch tank for collection of airbourne oil fumes. These are normally fed back into the air intake, which is not good for maximising power. 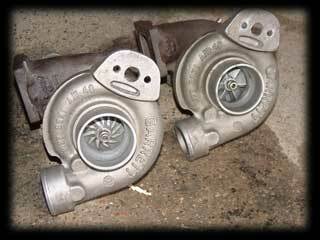 Once the new turbos arrived, they were fitted and the whole system re-assembled. One collant and engine oil flush later and we were back in business. Unfortunately, this is where the story gets most frustrating. Whilst running up the coolant, I noticed that the RH bank was still smoking slightly. Not a huge amount, but enough to raise concern. At first, I though tthat this might be oil residue from the original incident, but after some minutes, it became clear to me that there might be another problem. I double checked the plugs and discovered slight oil fouling on one cylinder. After a compression check, it was clear that something was definately wrong with the one pot.... could be time for an engine rebuild.